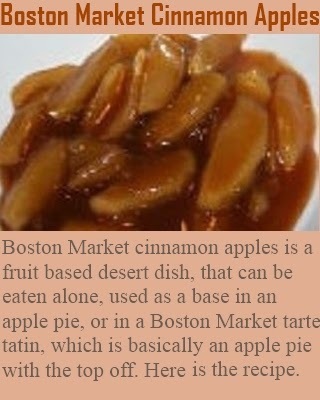 Boston Market cinnamon apples recipe is a fruit based desert dish that can be eaten alone or used as a base in apple pie or Boston Market apple tarte tatin which is basically an apple pie with the top off. More than a dozen Boston Market recipes plus more than 700 additional recipes from dozens of other famous restaurants can be in the found Americas Secret Restaurant Recipes 2 volume collection. In these two recipe books are exact step by step recipe instructions from world famous restaurants like Bennigans, Boston Market, Applebee's, Popeyes, Olive Garden and many more. -Peel and core the apples. -Cut each one into 16 slices and arrange the slices in an 8"x 8" baking dish. -In a small bowl combine the water with the flour, cornstarch, and Butter Buds and stir until the dry ingredients are dissolved and not lumpy. -Add the brown sugar and cinnamon and stir until smooth. -Pour the cinnamon mixture over the apple slices, cover the dish with foil, and bake for 40 minutes. -Stir the apples every 10 minutes. These prepared Boston Market cinnamon apples can be used as the base for the very delicious Boston Market cinnamon apple tarte tatin recipe which is basically an apple pie without the top which makes it a tad bit more applee and cinnamony tasting than regular apple pie.